Happy Thursday! It’s time for my Red Chair Makeover. 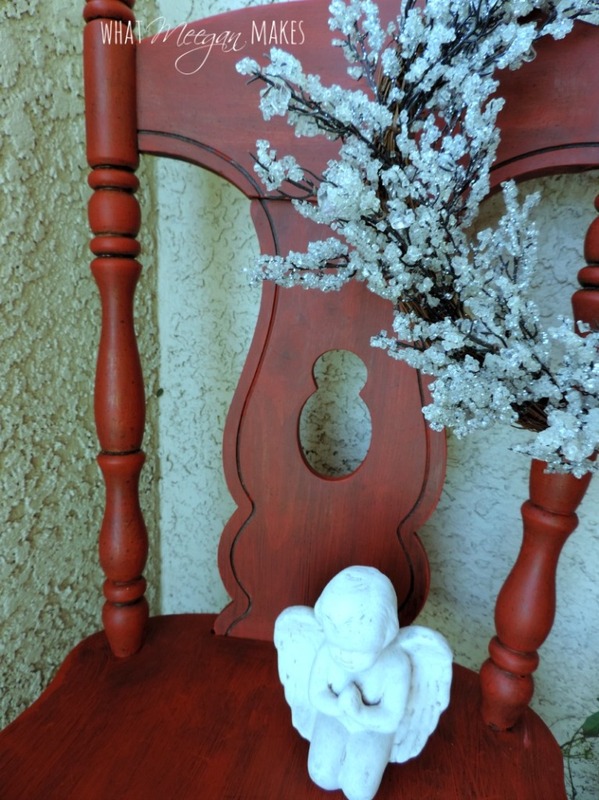 I am so excited to share my thrifted red chair makeover today. As you know, I LOVE blue. It is my all time favorite color. 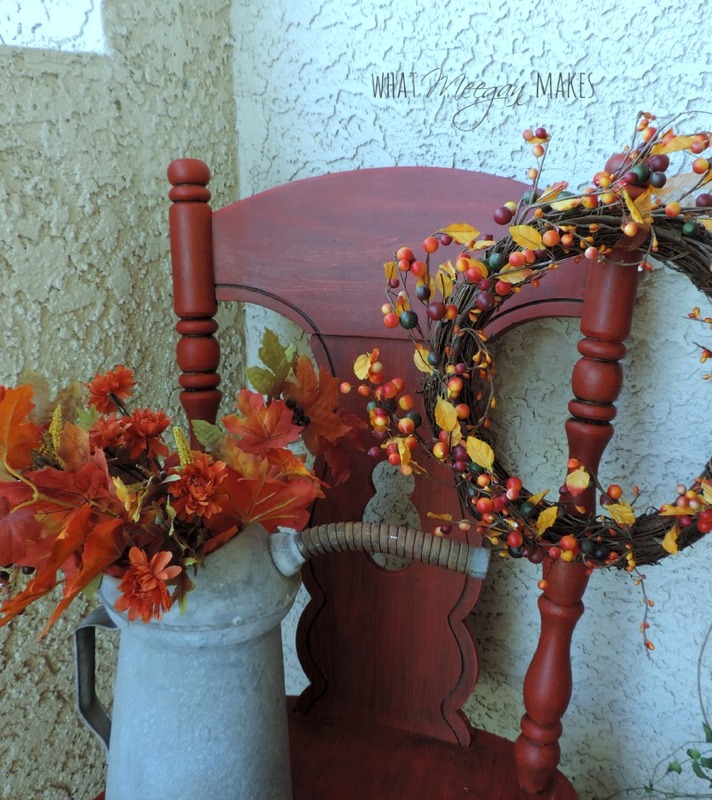 BUT, I have been wanting a pop of color on my front porch. I thought it would be fun to have something a little out of the ordinary. Like a Red Chair Makeover. I needed a chair for my porch. I have been using one from our dining area. But I don’t want it to get weathered and faded. So it still will match my other chair. I had decided my chair budget would be $7. And, if I didn’t find one, I would keep looking. I found a “golden” chair for $4!! The chair gods had lined up for me that day. Using regular ‘ol craft paint, I started painting my thrifted chair. After I painted awhile I realized I like the dark crevasses. It added so much to the details of the chair. I like the dark areas, because it looks like a dark wax effect. But it transitions perfectly into Christmas, or Valentines day, as well. 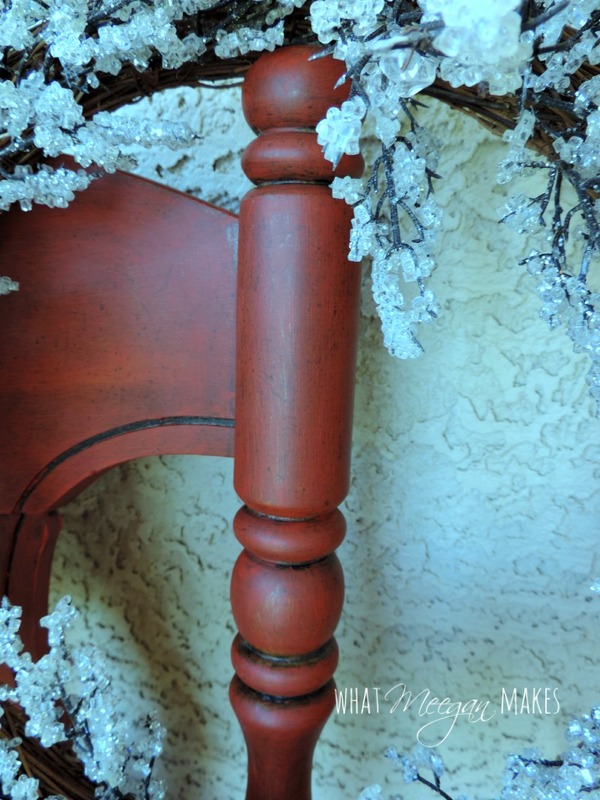 I only used one coat of Crimson Red, so I could still see the dark wood grain under the paint. 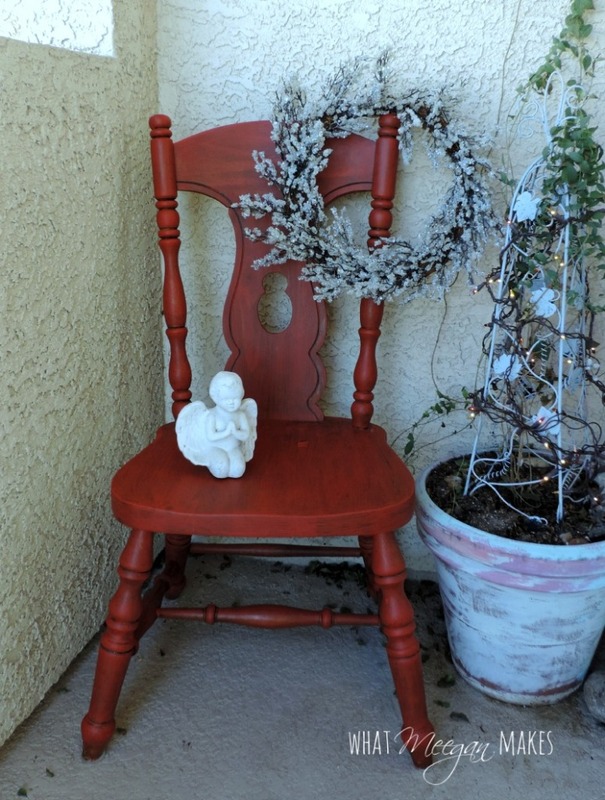 Painting my Red Chair Makeover was really an enjoyable project. It only took me about 40 minutes to get it just how I wanted it. I love when that happens, don’t you? I can’t wait to find another project to work on. This was SO easy and I love the outcome. Thanks for joining me today for my Red Chair Makeover. I have a chair i need to paint this has given me the courage. 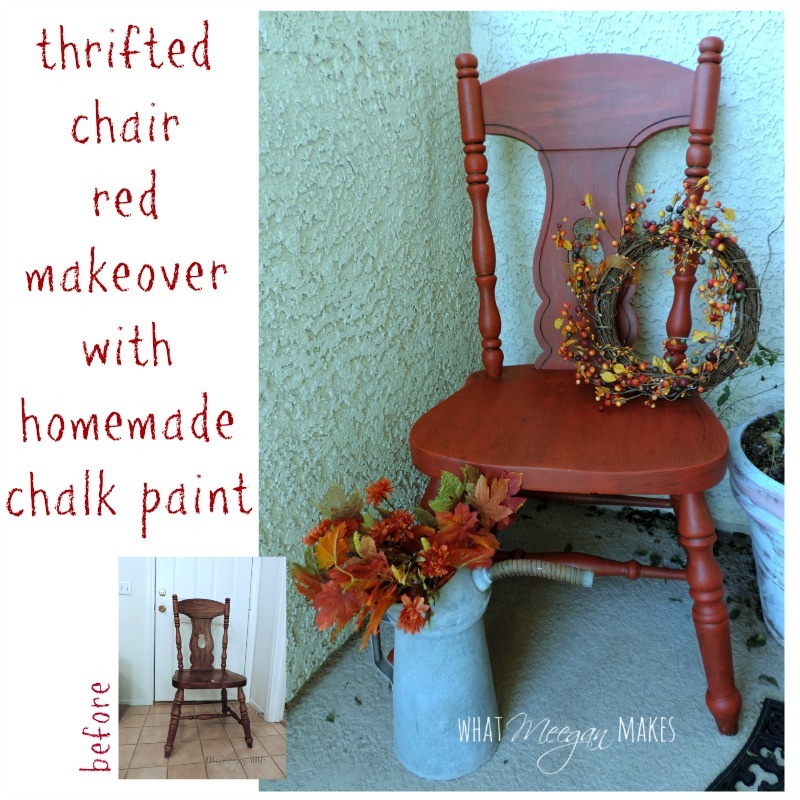 Will need the recipe for making the chalk paint. 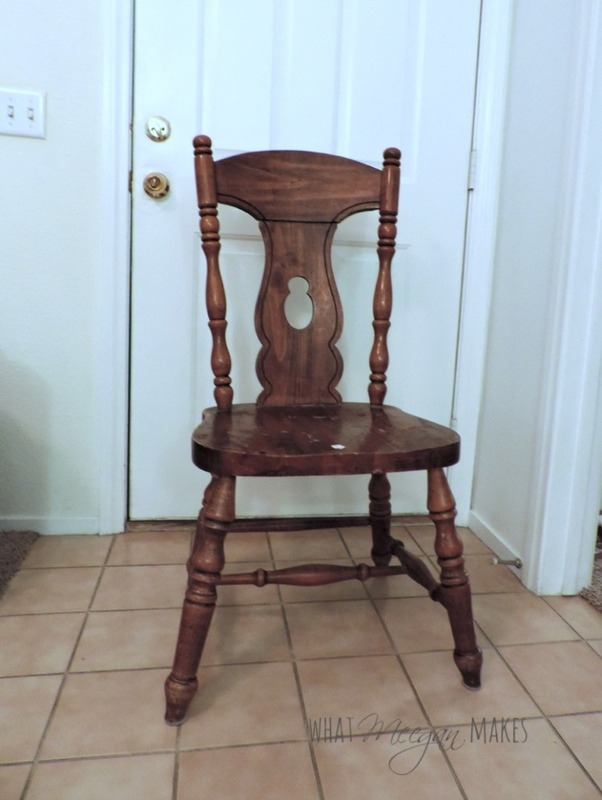 Wow, what a difference one coat of paint made on that chair! I love the effect of the dark brown poking through the red and like you said, how it gives the appearance of dark wax in the crevices. Very nice Meegan! I love the shade of red! Turned out really nice. I absolutely LOVE the way this turned out! I can’t believe you didn’t ave to wax or antique it to get that look! 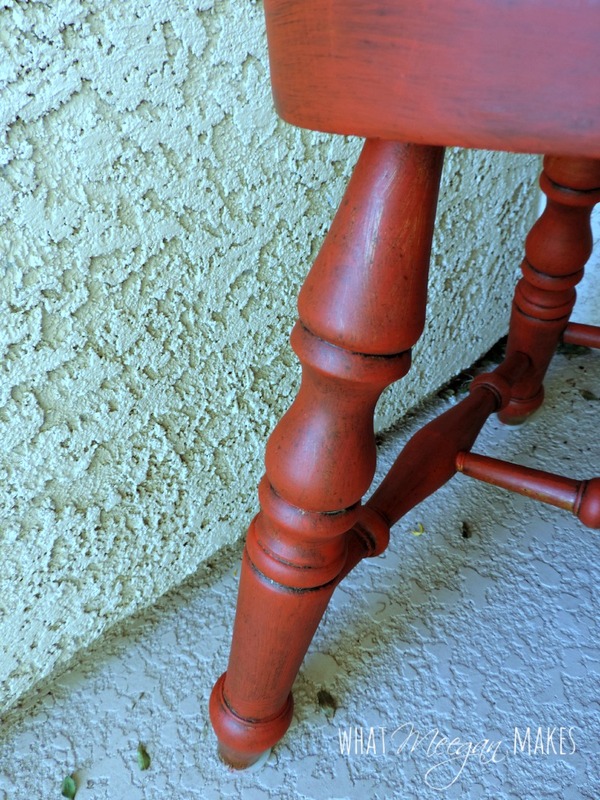 I use a lot of red- I know you mixed you chalk paint but can you share what red you used? It is so hard to find the “right” red and I think this one is perfect for a project I have in mind! Love the dark red that you used and how the details pop from the darker recessed areas. 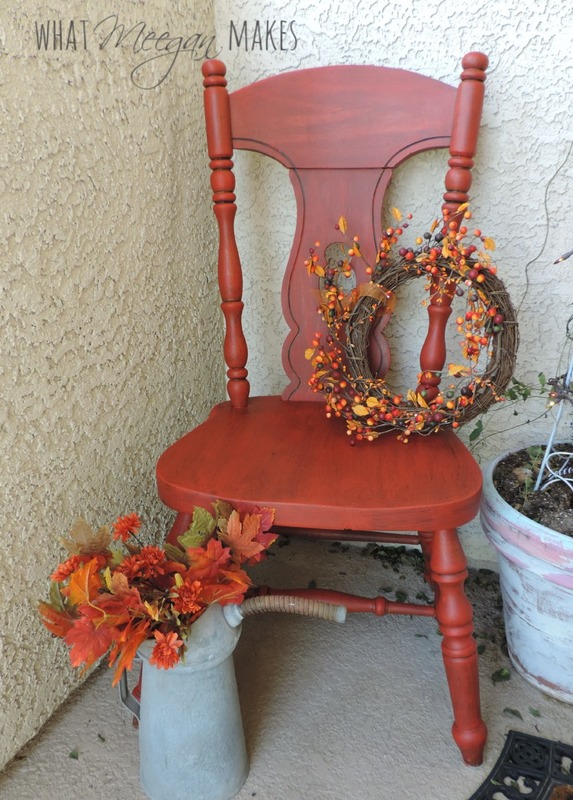 This makes a great porch chair! I love the red chair…of course red is my favorite color. The chair turned out beautiful!! Love it! Hi! Love the chair and the COLOR CHOICE! 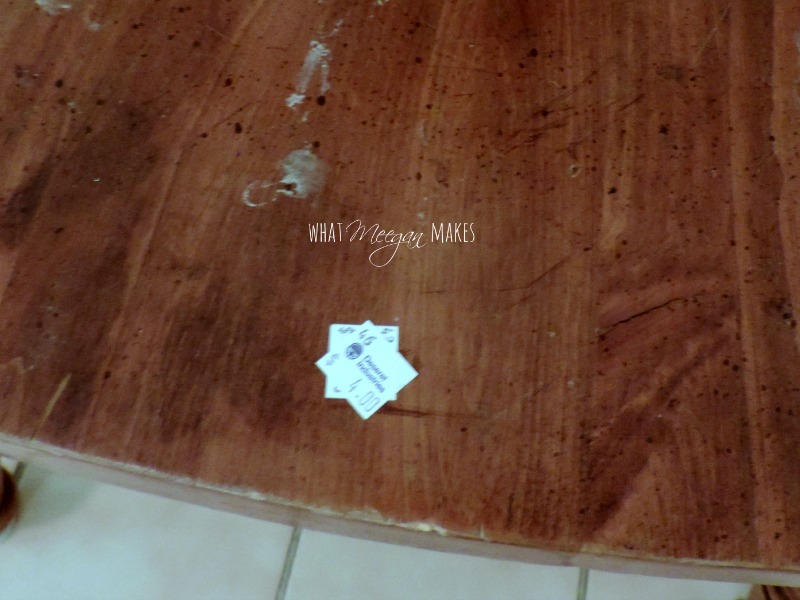 Please tell me what color(s) you used as I would like to do my dining room chairs that color. Thanks in advance! This is so pretty! i love the chair and the color you picked! I would love if you would share this at my blog party, Celebrate It! The party is all about celebrating our wonderful everyday life! Meegan, Your shade of red is the prettiest red I’ve seen in the whole collection! I love a good red but it’s hard to get the right shade..yours is spot on! Did you use aging wax on it as well? Great job!! Hi Meegan, your chair turned out wonderfully, good job! Would you mind sharing your chalky paint recipe! Please? I used 1 cup of paint, 1/3 cup water and 2 Tablespoons non-sanded grout.